Swinging at the PBC with the Squeezebox Trio (8th April 2015). Next party: Swinging at the PBC with the Squeezebox Trio (8th April 2015). Live jazz! At the peebs! 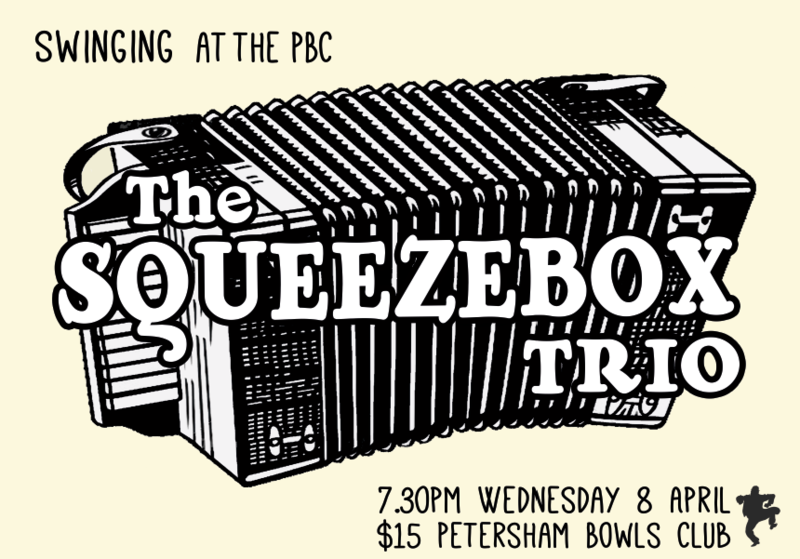 We welcome the Squeezebox Trio to the Petersham Bowling Club. 7.30pm Live music with the Squeezebox Trio. Cost: $15 for the band alone, or pay just $5 if you're doing the class as well (tickets at the door). The tiny PBC stage will be filled with musical instruments: accordion, violin, guitar, base... and the people who play them. The Squeezebox Trio delighted dancers at the Jazz BANG closing party in 2015, and they've had so much fun playing for us they wanted to do it again. And we're ok with that. They play a hot, swinging gypsy jazz, with a little extra grunt in the rhythm section to make for perfect lindy hopping.